Contaminated gasoline can be disposed of at Eastern Regional Landfill. A few spilled drops of gasoline can contaminate large quantities of clean drinking water. Never pour gasoline on the ground or down the drain. It will harm the environment and could lead to an explosion. Fire codes allows homeowners to store up to 25 gallons in containers, which hold no more than five gallons each. Always store away from ignition sources, such as heat, sparks or flames. Store away from your house in containers with approved labels and lids that will prevent spillage. Find out more. 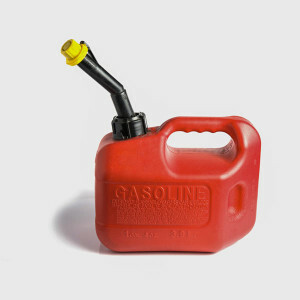 If you’d like to avoid putting old gas into your car, try using it in your gas-powered tools. Lawnmowers, leaf blowers and chainsaws can run on it. Offer unwanted gas to landscapers working in your neighborhood. They may be happy to take it off your hands, but make sure to disclose the fuel’s age.